Cordial provides a way to view performance over time for both subject line and body experiments. To view an automated message experiment's performance, open the desired automated message and click on the Experiments tab under Message Performance in the side navigation. 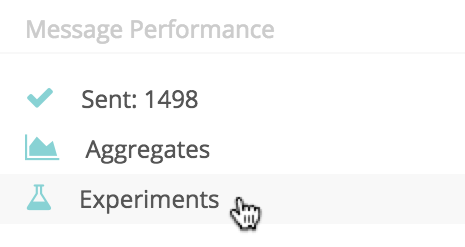 On the experiments performance page you will see individual results for subject line and body experiments. The example below shows the results of a subject line experiment optimized by open rate. Over time, the algorithm will adjust the sending of variations automatically based on performance. The example below shows that variation A is performing better over time and will thus be sent to more contacts. Variation B will continue to be sent, but at smaller numbers. If performance of variation B begins to improve, the algorithm will start sending it in greater numbers and evaluate performance. If a body experiment is run, you will see the results in a separate results table. The example below shows the results of a body experiment optimized for click to open rate. As with subject line experiments, body experiment variants will be sent automatically over time based on performance.